Last year Hotels.com demonstrated their mobile app by having veteran parachute jumper JT Holmes jump out of a plane at 20,000 feet over Lake Tahoe, and attempt to book a hotel room during his freefall. 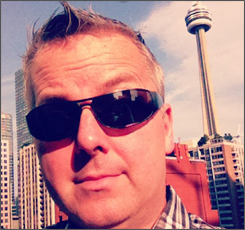 This year they’ve recruited former member Nitro Circus, and Kelowna, BC’s own Andy Bell for Xtreme Hotel Booking 2. Andy’s challenge? 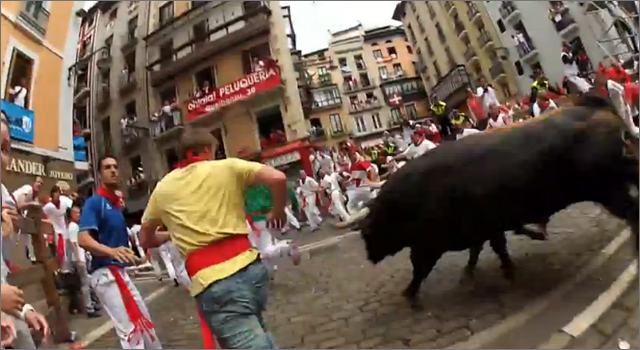 Use the Hotels.com mobile app to book a room while running with a herd of rampaging bulls in Pamplona, Spain. Every year hundreds of people are injured (mostly minor) during the runs at the festival, but the truly unfortunate part is most of these powerful bulls are killed as part of the bullfighting events that occurs in the afternoon. The ad was created by Y&R Chicago. Street artists 3D Joe and Max (Joe Hill and Max Lowrey) have traveled the world creating mind-bending optical illusions for brands such as Disney, Sprite, and Google. They are best-known for creating distorted street art using a technique that when viewed from the correct angle create an optical illusion of extreme depth. Last November, the duo braved the elements to claim Guinness Records for both the largest (3807 square feet) and longest (350 feet) piece of 3D artwork in a project promoting Reebok Crossfit. Their latest mind blowing project was created on the streets of Madrid, Spain to mark the European release of the latest Batman movie,’The Dark Knight Rises‘. 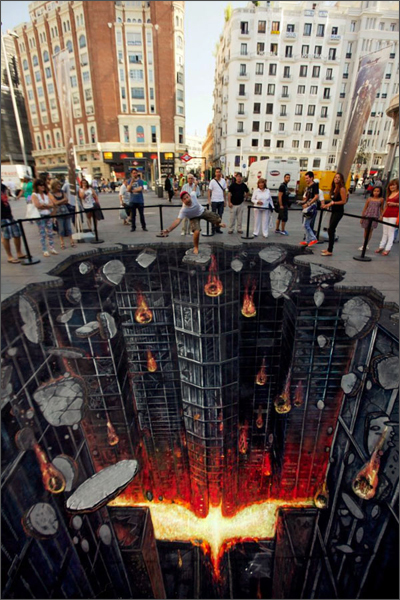 In the piece the street appears to be crumbling into a fiery lava pit shaped like the Batman logo. On May 19, people enjoying a quiet evening out at Placa de Roc in Sabadell, Spain were in for a wondrously noisy surprise. What appears to be a single street performer playing the opening notes of Beethoven’s Ninth Symphony quickly expands to include more and more musicians. The group eventually includes over 100 people from the Orchestra Simfònica del Vallès and singers from the Amics de l’Òpera de Sabadell, Coral Belles Arts and Cor Lieder Camera. 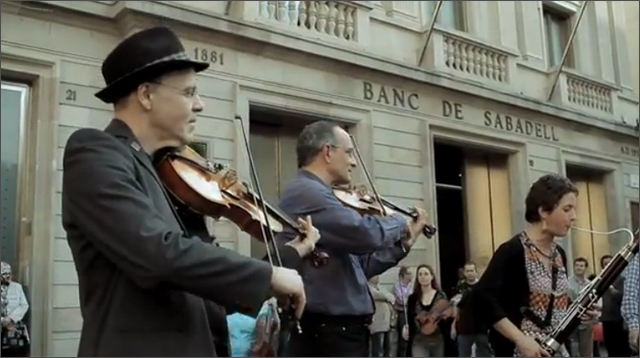 The flashmob was assembled to celebrate it’s 130th anniversary of Banco Sabadell. The creative agency for the flashmob was Remake and the film was shot by Onidea. First of all, I don’t mean ‘those’ kind of skidmarks, but based on a few of the close calls seen in the video I can’t vouch for the two drivers. Audi is celebrating the December 10 Derbi game between Real Madrid and FC Barcelona by putting two of their sporty A3s to a unique test of speed and agility on a foggy tarmac. 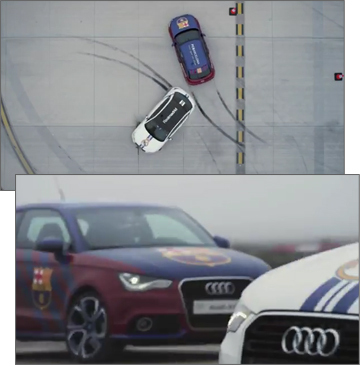 Audi happens to be the official vehicle sponsor for both Spanish football teams. As seen in the video the two drivers zigged, zagged and spun their Audis in controlled slides around the carefully positioned pylons. As they drove they laid down dozens of rubber skid marks in what appears to be random patterns. In the end, the results were anything but random as we see the skidding cars have created an abstract image of two football players battling for the ball. 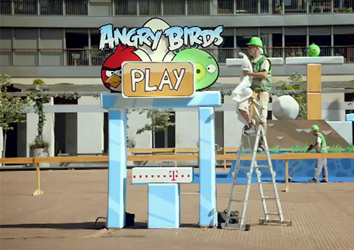 The campaign was created by the folks at DDB Spain.